Chaldean cuisine or Mesopotamian cuisine has a long history going back some 10,000 years – to the Sumerians, Babylonians Chaldeans and Ancient Persians. Tablets found in ancient ruins in Iraq show recipes prepared in the temples during religious festivals – the first cookbooks in the world. Ancient Iraq, or Mesopotamia, was home to a sophisticated and highly advanced civilization, in all fields of knowledge, including the culinary arts. However, it was in the Islamic Golden Age when Baghdad was the capital of the Abbasid Caliphate (750–1258) that the Iraqi kitchen reached its zenith. Today, the cuisine of Iraq reflects this rich inheritance as well as strong influences from the culinary traditions of neighbouring Persia, Turkey and the Syria region area. Contemporary Iraq reflects the same natural division as ancient Mesopotamia, which consisted of Mesopotamia in the arid northern uplands and Babylonia or Chaldea in the southern alluvial plain. Al-Jazira (the ancient Chaldea) grows wheat and crops requiring winter chill such as apples and stone fruits. Al-Irāq (Iraq proper, the ancient Babylonia) grows rice and barley, citrus fruits, and is responsible for Iraq's position as the world's largest producer of dates. Vegetables such as aubergine, tomato, okra, onion, potato, courgette, spinach, leeks, artichokes, garlic, peppers and chilli. Cheeses such as gubta, feta and halloumi. Herbs and spices such as cinnamon, cardamom, coriander, fenugreek, cumin, oregano, mint, thyme, saffron, dried lime, cassia, dill, turmeric, baharat, advieh, sumac and za'atar. Other Iraqi culinary essentials include olive oil, sesame oil, tamarind, vermicelli, tahini, honey, date syrup, yogurt and rose water. Lamb is the favourite meat, but chicken, beef, and fish are also eaten. Most dishes are served with rice - usually timman anbar, a yellowish, very aromatic, long-grain rice grown in the provinces of Anbar and Qadisiyyah. Bulghur wheat is used in many dishes, having been a staple in the country since the days of the Ancient Assyrians. Flatbread is a staple that is served, with a variety of dips, cheeses, olives, and jams, at every meal. Various stews served over rice form a major part of Iraqi cuisine. A feature shared with Persian cuisine (see Khoresht). Masgouf, a traditional Mesopotamian dish made with fish from the Tigris. It is an open cut freshwater fish roasted for hours after being marinated with olive oil, salt, curcuma and tamarind while keeping the skin on. Traditional garnishes for the masgouf include lime, chopped onions and tomatoes, as well as the clay-oven flatbreads common to Iraq and much of the Middle East. Falafel, a fried ball or patty made from spiced chickpeas and/or fava beans. Originally from Egypt, falafel is a form of fast food in the Middle East, where it is also served as a mezze. Kofta, a family of meatball or meatloaf dishes in Middle Eastern, Indian, and Balkan cuisines. In the simplest form, koftas consist of balls of minced or ground meat — usually beef or lamb — mixed with spices and/or onions. Vegetarian varieties include lauki kofta, shahi aloo kofta, and malai kofta. Iraqi rice cooking is similar to the method used for Persian chelow, a multistep process intended to produce just-tender, fluffy grains. A prominent aspect of Iraqi rice cooking is the hkaka, a crisp bottom crust. It differs slightly from the Persian tahdig, which is a single thick piece; the hkaka contains some loose rice as well. Before serving, the hkaka is broken into pieces so that everyone is provided with some along with the fluffy rice. Biryani, a set of rice-based foods made with spices, rice (usually basmati), and meat/vegetables. It was brought to India by Persian Muslim travellers and merchants, and is collectively popular in Iraq, Kuwait, Iran, Afghanistan, Pakistan, Bangladesh, India and among Muslims in Sri Lanka. Geimar, a creamy dairy product, similar to clotted cream, made in the Balkans, Turkey, the Middle East, Central Asia, Iran, Afghanistan, and India. It is made from the milk of water buffalos in the East or of cows in the West. Labaneh, yogurt which has been strained in a cloth or paper bag or filter, traditionally made of muslin, to remove the whey, giving a consistency between that of yogurt and cheese, while preserving yogurt's distinctive sour taste. Sammoun, a flat and round bread, similar in texture and taste to the Italian ciabatta. Mahlab, an aromatic spice made from the seeds of the St Lucie Cherry (Prunus mahaleb). Arak, a clear, colourless, unsweetened aniseed-flavoured distilled alcoholic drink. Arak is usually not drunk straight, but is mixed in approximately 1/3 arak to 2/3 water, and ice is then added. 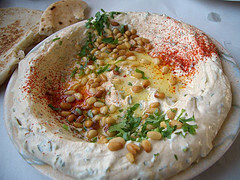 ↑ 1.0 1.1 1.2 1.3 1.4 1.5 http://www.thingsasian.com/stories-photos/3592 Foods of Iraq: Enshrined With A Long History. Habeeb Salloum. ↑ 2.0 2.1 2.2 2.3 2.4 2.5 Albala, Ken (2011). Food Cultures of the World Encyclopedia. ABC-CLIO. pp. 251–252. ISBN 978-0-313-37627-6. ↑ 3.0 3.1 3.2 3.3 Davidson, Alan; Jaine, Tom (2006). The Oxford Companion to Food. Oxford University Press. p. 405. ISBN 978-0-19-280681-9. ↑ 4.0 4.1 "History and Agriculture of the Pistachio Nut". IRECO. Retrieved 27 February 2012. ↑ 5.0 5.1 5.2 5.3 Lawton, John. "Mesopotamian Menus". Saudi Aramco World, March/April 1988. Saudi Aramco. Retrieved 30 March 2012. ↑ 6.0 6.1 6.2 6.3 6.4 6.5 Marks, Gil (2010). Encyclopedia of Jewish Food. John Wiley & Sons. p. 585. ISBN 978-0-470-39130-3. This page was last modified on 2 August 2015, at 15:38.